Home bars inspired by the exotic. Island style and Asian bar accessories. Double-hammered stainless steel martini shaker with cast iron coaster. Citrine mouth blown glass juice glass with pepita engraving. 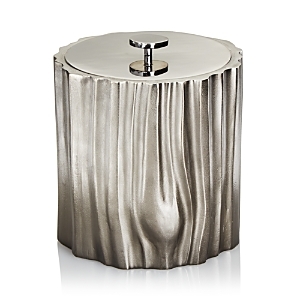 Double-hammered, double-walled stainless steel ice bucket with cast iron coaster. Handmade mouth blown glass goblet with blue and green swirl design. Double-hammered, double-walled stainless steel ice bucket with fitted lid and cast iron coaster. Mouth blown glass pitcher with ribbon detail. Make happy hour an elegant affair with this cocktail set from Hotel Collection, two exquisite glasses with gleaming metallic pedestals. 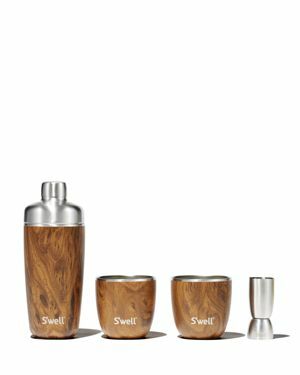 Expertly measure, shake and serve your favorite cocktails at home with this stylish stainless steel shaker set from Hotel Collection. Metallic gold-tone bases add luxe style to this perfectly proportioned set of four Century Metallic double old-fashioned glass by Hotel Collection. Iron bar bucket with removable, double walled stainless steel chiller. A luxe look with gold-tone at the base, this perfectly proportioned set of four Century Metallic highball glasses from Hotel Collection elevates any gathering. Pineapple ice bucket. 6.5"Dia. x 11"T. Goldtone-finished stainless steel. Handcrafted tray. Stainless steel, natural and oxidized bronze, and high-density polymer. Pineapple-shaped container holds removable cocktail shaker. Aluminum. Beverage tub with octopus base. Nickel-plated cast aluminum. Handcrafted elephant figurine head set on a beautiful hand-blown glass decanter. Hand-painted enamel and set with Swarovski® crystals. Madi Morgan: New Leaf. Designer Madi chooses a simple leaf and takes this organic shape into a classic functional design. Nickel-plate stirrer with monkey detail at end. A stylish lined design trims the Martha Stewart Collection's sleek stainless steel ice bucket that features a smart lid, convenient handle and handy tongs. Cocktail shaker forged of 18/8 stainless steel. Double walled-nickel plated head. Black nickelplate/stainless steel/polished aluminum Set of six coasters with box and lid. Wood and natural horn. German silver hardware. Rhino-shaped beverage tub. Nickel-plated cast aluminum. Handcrafted serving tray. Stainless steel, antiqued gold-tone metal, and high-density polymer. Bar set made of stainless steel. Airplane-shaped barware made of nickel-plated metal. Handcrafted stainless steel ice bucket wrapped in decorative straw fabric. Polyethylene/polyester fabric. Handcrafted square coaster set. Leather, water-treated coasters with nonskid bottoms to keep drinks in place and furniture safe. Wrapped in decorative straw fabric. Includes a square leather tray to store and keep your coasters. Handcrafted tray wrapped in decorative straw fabric. 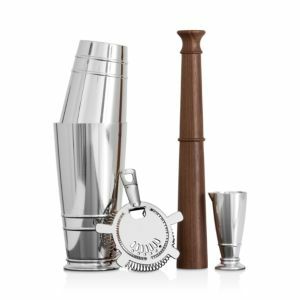 Handcrafted stainless steel cocktail shaker. Handcrafted stainless steel flask wrapped in decorative straw fabric. Mix, measure, shake, strain, slice and serve like a master mixologist with the Martha Stewart Collection's sleek stainless steel bar tool set. Thirstystone Glass Ice Bucket with Rope Handle Handcrafted turtle figurine set on a wine stopper with stand. Hand-painted enamel and set with Swarovski® crystals. Set includes: 2 oz. jigger, muddler, strainer and shaker. Stainless steel/walnut Handcrafted nesting drink tubs. Hand-painted and carved resin. Set of two. Inspired by Tuscan appreciation for fine wine, the classically shaped bowls of this stemware are designed to emphasize the rich colors and sweet aromas of your favorite beverage for a chance to experience wine like those in Italy's famous wine country. Store your favorite wines or beverages in this Wine and Beverage Cooler. The EL-20GMBC will blend seamlessly into your home with its sleek patent-pending mirrored frame design, glass door and recessed handle. Hotel Collection stirs a stylish black nickel finish into the mix of media that creates this crafty set of essential bar tools. 18/8 stainless steel ice bucket. 7"Dia. x 9"T. Naturally shed buffalo horn handle. Base, dishwasher safe; hand wash lid. Thermas'well™ technology keeps beverages cold for 24 hours and hot for 12 hours. Eco-friendly, BPA-free, reusable. Triple-walled with a copper layer, vacuum insulation Nine-piece Stainless steel bar set in a copper finish. Set of four coasters. Lapis and brass hardware. Wax cast iron bull with stainless steel bottle opener. Leather stitched sleeved flask with square top. Sleeve is removable. Handcrafted triple shot glass. Hand-blown glass with hand-etched design. Beaded iron base. A geometric pattern enhances the modern profile of Hotel Collection's 4-piece glass set, a distinctive addition to any bar or drinkware collection. Glass decanter. Mirrored circle antiqued glass and iron topper. Glass decanter. Wood cross topper. Iron coaster. Adam and Eve wax cast iron stands. Clear glass cordial top. A drop of black in each slender stem of this set of martini glasses from Hotel Collection lends an air of distinction to cocktail hour. Mouth blown glass double old fashioned glass with embossed cube texture. Each glass is handmade; size and color will vary slightly. Handcrafted, oversized martini glass. Clear hand-blown glass. Features traditional pepita etching. "Wee-bee" detail on foot. Hotel Collection's Bubble Rocks Glasses are ideal for serving morning juice or evening cocktails. Set includes four classically-shaped glasses with straight sides and thick bubble bases Handcrafted double old-fashioned. 4"T; holds 10 ounces. Handmade crystal. Clear glass with etched bee. 3.75"Dia. x 4"T.
Refine the home bar with Aberdeen Windows barware by Godinger. Vertical cuts accentuate clear crystal, elevating cocktail hour with classic style. This modern take on classic crystal glassware features clean lines and geometric appeal for a superior entertaining experience. Stacked decanter and glasses. 24% lead crystal. Includes 8-oz. decanter and two 8-oz. glasses. Put a personal spin on entertaining with hand-etched monogrammed barware Guest towels and cocktail napkins have the look of linen and feel of cloth with the convenience of paper made from jute using FSC-certified pulp and water-based inks. Made in Germany. Lobster-design cocktail napkins and guest towels hail the season whether actually at water's edge or simply enjoying the moment on very dry land These unique paper napkins and guest towels allow you to try a fun new look for the next party without committing to a whole new set of linens. Just use and toss.